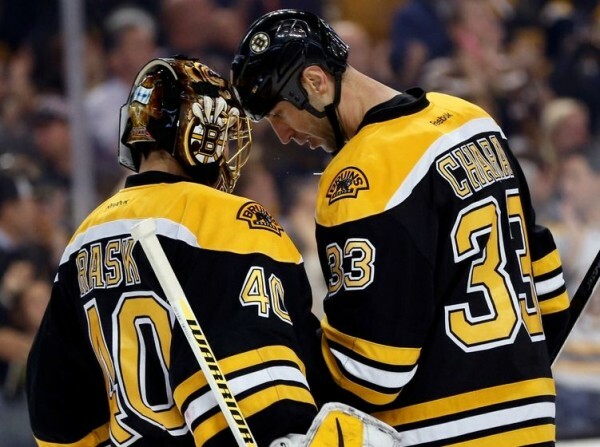 A big game from Tuukka Rask at goal and a late winner from Chris Kelly pulled the Boston Bruins through a chippy season opener against the Philadelphia Flyers, coming away with a 2-1 victory. Kelly and the Bruins feel a chip on their shoulder after last season. They finished with the best record in theNHL, but were knocked out by the Montreal Canadiens in the conference semifinals. The Bruins took the lead in the first home game of the season as Reilly Smith too advantage of the power play in the first period, and in between the Bruins made Steve Mason look very good in goal for the Flyers, making 31 saves out of the 33 shots taken to test him. The Flyers got back in a game they were mostly on the defensive in, scoring in the third period with Sean Couturier equalizing after some nice set up job from Jakub Voracek and Matt Read. The Bruins weren’t the only team on opening night to get a late goal to seal the deal. After a high save from Mason on a shot from Adam McQuaid, Kelly slid in behind the goalkeeper to score a cheeky goal off the rebound. The Bruins lost a lot of talent during the offseason, including Jerome Iginla, the team’s top scorer last season. With him, Shawn Thornton and Johnny Boychuk. That hasn’t taken away from the excitement of going into this season, as the TD Garden was sold out for the 214th consecutive time, showing just how good things have been for the Bruins over the last five or six seasons, with the franchise going through a very positive turnaround. They always have a solid team. No matter who is in their lineup, they play the exact same way. We were a little bit jittery for probably the first period and a half, and it cost us. The Flyers had Zac Rinaldo penalized twice and taken out for two minutes at a time for fighting with just about everyone on the Bruins team at the time he was on the ice. Bobby Robins and Luke Schenn were each handed five minutes for fighting, although that scuffle also began with Rinaldo. For the 32 year old Robins, it was the first ever NHL game after years of minor leagues and playing in Europe. After nine years to have that happen was a dream come true, and to play here at the Garden. It was a very special feeling, I’ll never forget it. I know the brand of hockey these Boston fans like, and I just hope to be able to provide that. And to get that kind of reception was a great feeling. Schenn was asking if it was my first NHL game. So, I said, `Yeah.’ He just said, `Good fight’ — the normal stuff guys say after a fight.